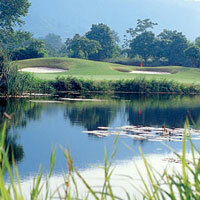 Formerly The Country Club Khao Yai, Kirimaya is now a true upscale, world class golf resort with prices to match. The golf course is the center piece, and the Nicklaus design team once described it as one of the 3 best in Asia. Nine holes out, and nine holes in, you'll struggle to see another group as the holes weave their way around what is the best course design in Thailand in our opinion. It has stayed relatively out of the public eye due to Khao Yai being somewhat of a boring holiday destination, but look for this course to the attention it deserves in the future. Spectacular mountain golf, probably a little too much for the high handicapper, but with five sets of tees it makes it a less daunting. Real golfers will appreciate the shotmaking demands and strategic course management required to shoot a good score here.